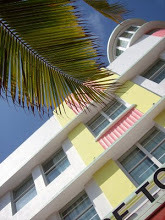 The Tides is the most exclusive Art Deco hotel currently on Ocean Drive of South Beach. It stands tall, with no "eyebrows" (you'll have to take my Art Deco tour to learn about this term) and unassuming, the bland beige color masks the luxurious interior. 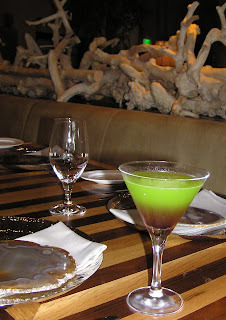 The Tides is also home to another well kept secret--an upscale seafood restaurant, La Marea. When I walk my tour clients into this lobby and then the adjacent restaurant, the reaction is predictably the same. 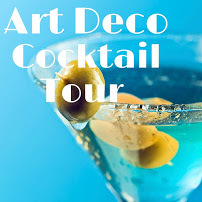 If you love interior decor, this is a must see. Every detail from the womb chairs, the eyecatching place settings, and rows of turtle shells lining the wall, leaves a memorable impression. It's quite inviting. This past Friday I had the pleasure of dining at this seafood establishment for lunch. Worried the menu prices matched the lavish all-suite hotel guest room rates, I was pleasantly surprised that lunch was within my recessionary budget. To freshen up from the heat wave, a Tides Royale cocktail perked me up. A blend of liquors, I immediately tasted rum. What were the green and brown colors? You'll have to try it and guess. Just leave a comment below! 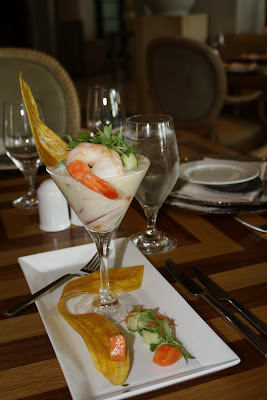 For starters, I had to try the Tropical Ceviche. Outside the heat and humidity clung to your body. So a ceviche with its protein and citrus juices is light (low fat!) but filling and the perfect antidote to the heat wave. La Marea's ceviche is a combination of shrimps, Mahi Mahi, jalapenos, red onions, papayas, cucumber and cilantro, cured in a mix of coconut milk, lime and orange. No skimpy portions here. The ceviche was served in a deep cocktail glass which exceeded expectations. For my entree, while I was tempted by the Seafood Salad, I went with a favorite, the Cobb Salad. 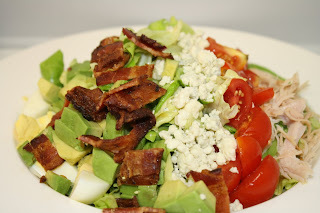 A presentation of perky Boston lettuce with turkey breast, crispy bacon, perfect boiled egg, blue cheese, cherry tomatoes, avocado and blood orange vinaigrette, the salad was heavy on the main ingredients and light on the dressing, not drowning. My dining companion did choose the Seafood salad, if nothing else, for my curiosity so I could blog about it. 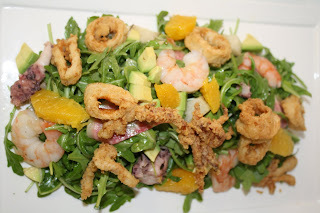 The Seafood Salad is a base of avocado mousse and baby arugula covered with baby octopus, shrimps, fried calamari, orange segments, mixed radish slices and Agrumento EVOO. For dessert I chose the Floridian Flan. 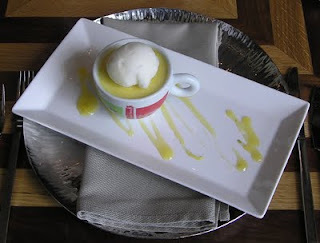 This was a surprising light orange twist, and not so sweet like traditional Cuban flans, accompanied by a lemon sorbet. Absolutely refreshing and light! I highly recommend La Marea for lunch. Indoors the restaurant is lit with natural sunlight and you can readily get a table for two by the window and still people-watch at the same time. No reservations needed. The restaurant is a quiet refuge from the bustling cafe-style restaurants on Ocean Drive where waitresses are soliciting/hustling passerbys. A quick note: they are updating the online menu to match the current menu. Enjoy the ebb and flow (the translation of La Marea) of fine dining! The restaurant sounds great and a potential spot to try when we visit. 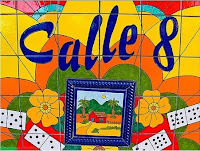 We love cevichy and are looking forward to trying it here in August. If the food taste anything like it looks...I bet we'll be in for a real treat! Can't wait until August to try it!